Bargains is a browser extension that should provide users with the best deals in order to help them save money. The application says that it will install a light-weight browser extension in order to help users. 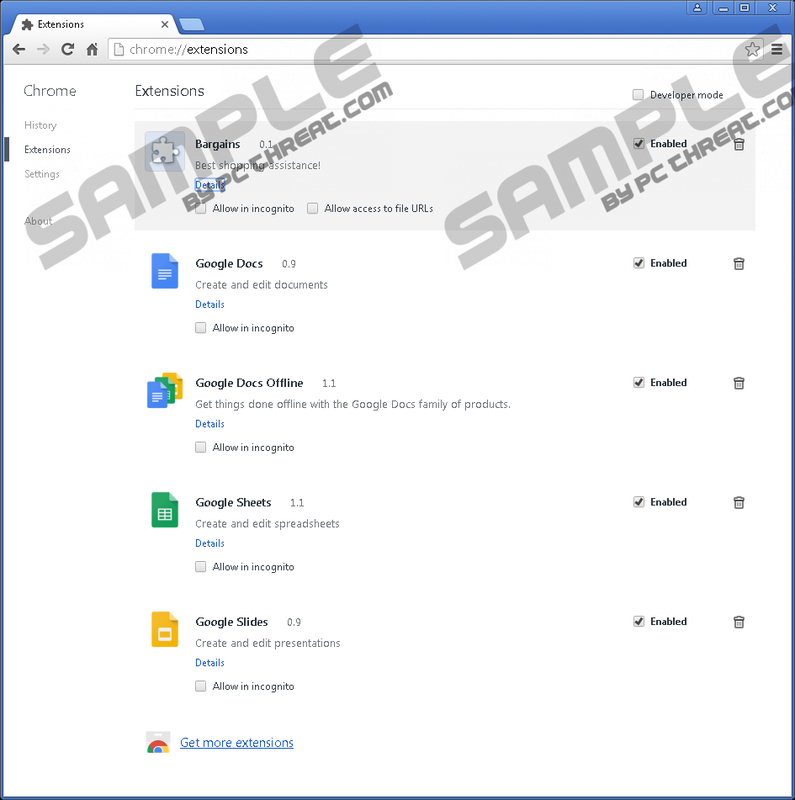 It is said on the official website of this program that it works on all the browsers and is compatible with Windows OS, Linux, Mac OS X, and Chrome OS; however, it seems that it installs the extension on Google Chrome only. Of course, other versions of this program might exist too, and you might notice the extension of Bargains on Mozilla Firefox and Internet Explorer one day as well. Do not worry; extensions for these browsers can be erased rather easily too. We know that users who do not want to erase Bargains exist too. If you are one of them, we still highly recommend that you read this article from beginning to end because we will provide more information about this adware. We hope that we will manage to change your opinion about it and thus convince you to get rid of it. We will try to explain you briefly why you need to delete Bargains from your system. Yes, we understand that this program looks very trustworthy because it promises to “show better deals before you shop online, and save you money”; however, we also know that it will not help you to save cash because it is an ad-supported program (adware) that is going to show advertisements for you. It definitely does not do that to save you money. According to researchers at pcthreat.com, this software acts like that in order to increase the traffic rate of particular third-party web pages. All these advertisements will redirect to third-party websites immediately. Unfortunately, nobody knows whether the website will be trustworthy or not, which means that users might surf corrupted websites and do not even know about that. Generally speaking, you might cause harm to your PC if you keep Bargains installed and click on its advertisements. It is quite easy to recognize them because they have the “Ad by Bargains” label; however, it is not enough to promise not to click on any of them because you might do that accidentally and thus end up on a third-party website. If you really wish to protect your system from harm, you need to uninstall an adware program which is responsible for these ads. Bargains is also interested in users’ browsing habits, according to researchers. Like other similar threats, this infection is primarily going to record information about users’ habits and their activities on the web. It is likely that advertisements it is going to show you will be based on this information in order to make ads look appealing. Unfortunately, we do not know whether the collected information will not be transferred to cyber criminals and used for other bad purposes. If you do not want to risk experiencing privacy-related problems, you should remove Bargains as soon as possible. We are going to help you with that in the last paragraph of this report. Specialists at pcthreat.com have managed to find out that the Bargains extension is usually installed on the system after a user installs freeware or shareware from an unreliable website. If you wonder how it is possible, you should know that this software usually travels in software bundles together with other applications. Believe us; other infections might sneak onto your computer in software bundles as well. To make sure that this does not happen, you should install a security tool on your computer and keep it there all the time. 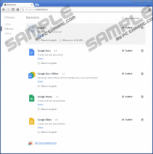 As we have already told you, Bargains usually appears as an extension for Google Chrome (C:\Users\user\AppData\Local\Google\Chrome\User Data\Default\Extensions\ojnpjadapidgjcdkmcehlcajhcckagjp). Of course, it might affect other browsers too. Luckily, it is not that hard to eliminate Bargains. Below-provided instructions will help you to get rid of this advertising-supported application. If you are an inexperienced user and they do not help you at all, or you simply do not have time to get rid of this threat yourself, you should scan your system with an automatic malware remover, such as SpyHunter. We are sure that it will manage to find and delete all the existing infections for you. Click the recycle bin button placed next to it. Open your browser and tap Ctrl+Shift+A keys one after the other. Select the unreliable extension and get rid of it. Find and select the undesirable extension. Quick & tested solution for Bargains removal.